May 2016. 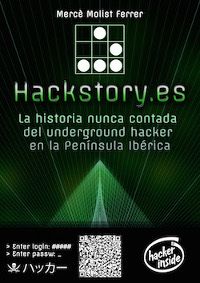 We are on Phrack 69 with this txt: A short historical guide to the first Spanish hackers. Thanks a lot!!! August 2012. Our crowdfunding campaign has been very successful: 6.000 euros, 170% of what we expected. Thanks to it, we'll publish a book about latin hacking. Also, aprox 30 people want to help us in writing articles for Hackstory, looking for information or giving their counseil about technical and historical facts. Thank you very much! May 2012. We're doing a great crowdfunding campaign: http://www.goteo.org/project/hackstory . Thanks to it, we'll publish a book with information extracted from Hackstory: a book about spanish and latinoamerican underground on their golden age. January 2011. The project re-starts. August 2008. Creating HackStory wiki. This page was last modified on 19 October 2018, at 22:21. This page has been accessed 44,689 times.